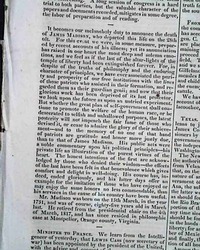 NEW YORK SPECTATOR, Dec. 20, 1831 Pg. 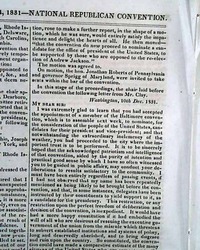 2 has a letter signed: H. Clay, concerning his possible nomination for President. 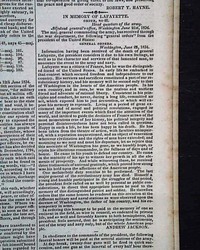 More on him on pg. 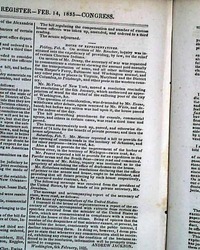 3 as well. 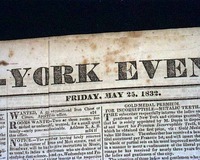 Some scattered foxing, generally nice. 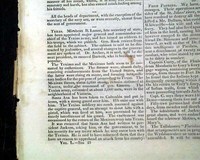 Folio-size, 4 pages. 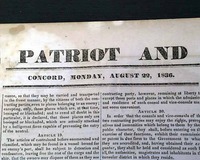 NEW HAMPSHIRE PATRIOT AND STATE GAZETTE, Concord, Dec. 3, 1832. 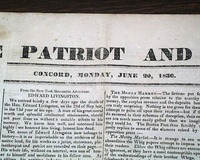 The back page has a poem about Andrew Jackson: The Patriot President. 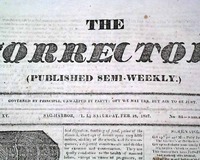 Tune-- Whall be King but Charley. 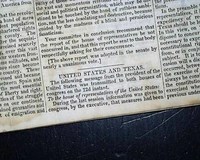 News of the day includes: "Louisiana Election" "Presidential Election" "Federal Calculation" and much more. 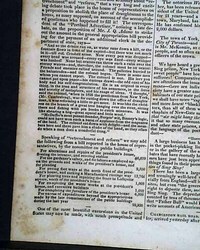 8 pages in nice condition. 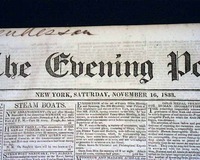 NATIONAL INTELLIGENCER, Washington, D.C., Dec. 6, 1832 Almost the entire front page is taken up with the annual state-of-the-union address, signed in type at its conclusion by: Andrew Jackson. 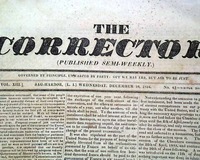 As was typical with this annual tradition, President Jackson reviewed the events of the year addressing the broad scope of work which concerned the nation in 1832. 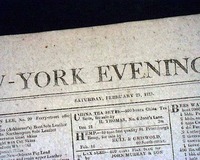 EVENING POST, New York, NY, December 8, 1832. 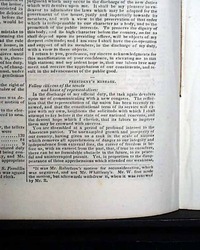 Page 2 has a message from the President to the Senate explaining why he returned a bill that provided for "...the settlement of claims of States, for interest on advance to the United States...", signed in type: Andrew Jackson. 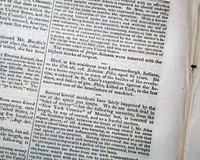 Other news of the day with many ads. 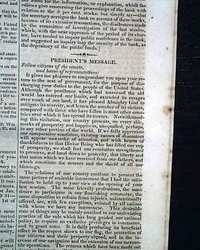 Page 2 has a reply from the President concerning an invitation from the citizens of Hartford, stating he would visit there soon when his schedule would permit, signed in type: Andrew Jackson. 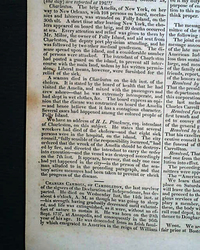 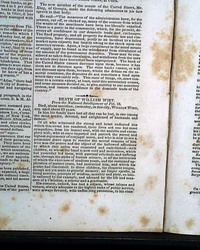 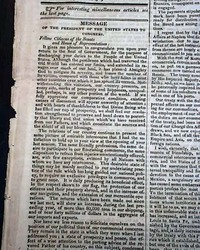 On page 2 under "Progress of the President" is a detailed report about Andrew Jackson's visit to New York City. 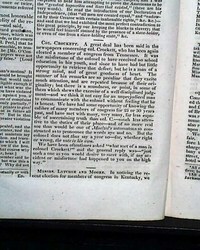 Parts of the report describe his appearance and more. 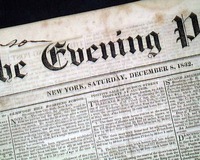 EVENING POST, N.Y., Nov. 16, 1833. 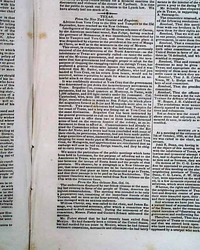 NATIONAL INTELLIGENCER, Washington, D.C., Dec. 5, 1833 Almost the entire back page is taken up with the President's annual state-of-the-union address, signed in type at its conclusion by: Andrew Jackson. 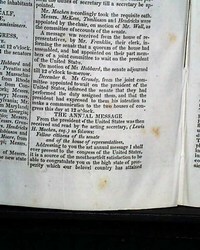 It is headed: "MESSAGE From The President of the United States to Both Houses...". 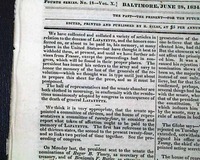 NILES' WEEKLY REGISTER, Baltimore, Maryland, July 5, 1834 Within this issue is a report headed: "In Memory of LaFayette" being a "General Order" concerning the death of LaFayette, signed in type by: Andrew Jackson (see). 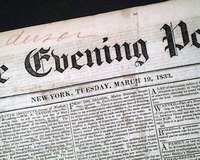 NILES' WEEKLY REGISTER, Baltimore, Maryland, Feb. 14, 1835 Inside has two items concerning the attempted assassination of President Andrew Jackson, with: "Case of Richard Lawrence", the assassin, followed by: "The Attempted Assassination" with has various particulars. 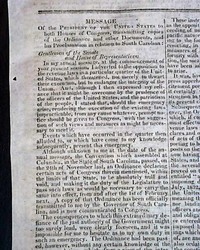 Elsewhere is a letter to the House of Representatives signed in type by: Andrew Jackson. 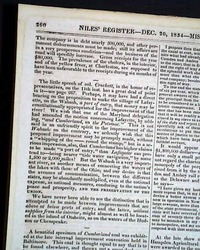 NILES' WEEKLY REGISTER, Baltimore, Maryland, December 12, 1835 The prime content in this issue is the very lengthy annual state-of-the-union address of the President, taking eight pages and signed by him in type: Andrew Jackson. 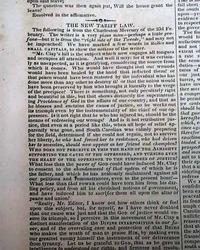 A very detailed review of the events of 1835. 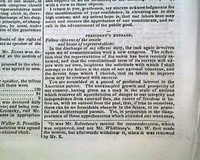 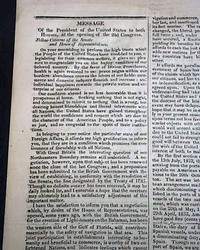 The prime content is the very lengthy annual state-of-the-union address of the President, taking eight pages and signed by him in type: Andrew Jackson. 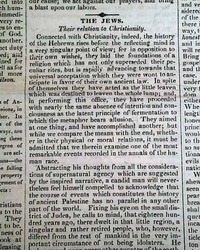 A very detailed review of the events of 1835. 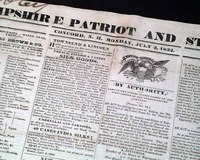 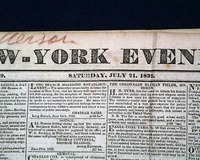 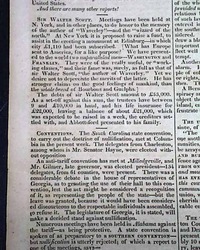 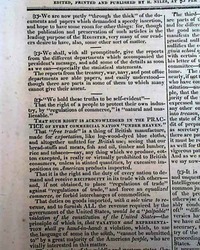 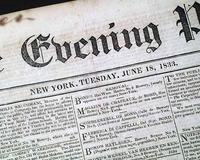 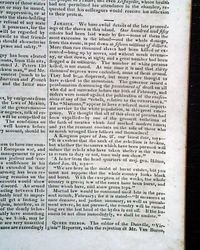 NEW HAMPSHIRE PATRIOT AND STATE GAZETTE, Concord, June 20, 1836 On the front page under a woodcut of an eagle is "AN ACT to extend the western boundary of Missouri to the Missouri River", signed in type: Andrew Jackson. 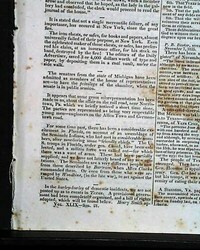 This created what is now the northwest boundary of Missouri. 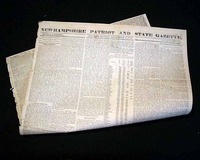 Has a non-archival mend to a tear in the outer margin, occasional foxing. 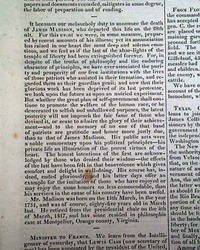 On the front page under an engraving of an eagle grasping arrows in its talons. 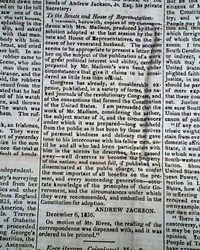 NATIONAL GAZETTE & LITERARY REGISTER, Philadelphia, Dec. 10, 1836 Page 2 has a letter "to the Senate & House of Representatives" signed in type by the President: Andrew Jackson. 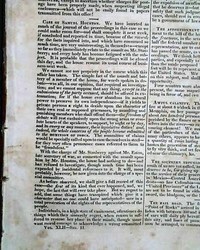 Four pages, never bound nor trimmed, light browning at some of the folds, mostly good. 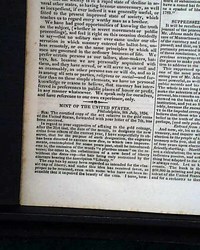 NILES' WEEKLY REGISTER, Baltimore, Dec. 10, 1836 Over four pages inside are taken up with: "The Annual Message" being the President's state-of-the-union address, signed in type: Andrew Jackson. 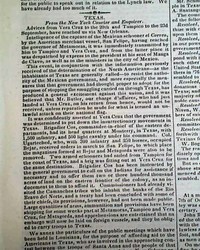 This lengthy address is an excellent overview of the events of 1836. 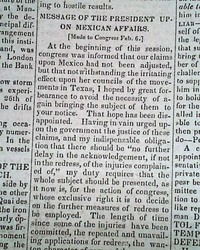 VERMONT GAZETTE, Bennington, Feb. 14, 1837 Page 2 has: "Message Of The President Upon Mexican Affairs" which is signed in type: Andrew Jackson, & takes over half a column. 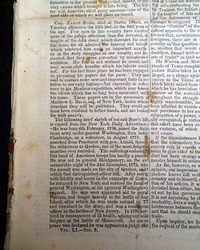 Four pages, rejoined at the spine, tape mends on pgs. 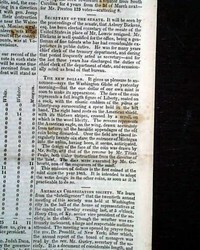 2 & 4 otherwise nice.